Picture this: fully loaded 36-tonne 18-wheel trucks queuing up on a 10-kilometre-long stretch of road. 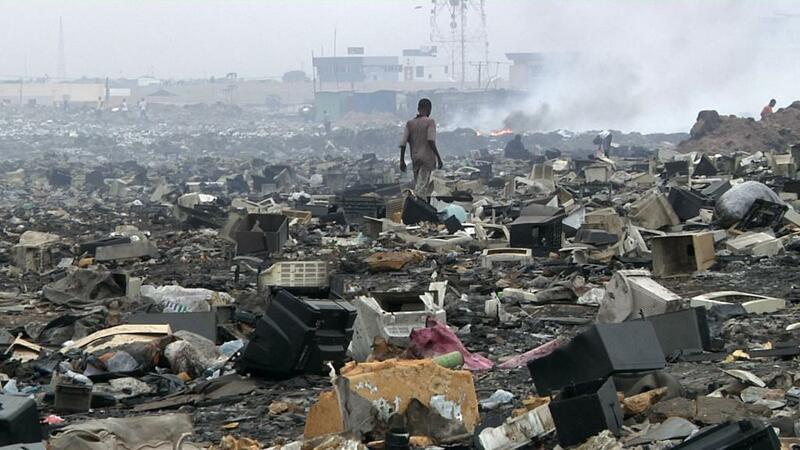 That is the volume of e-waste illegally imported to Nigeria each year. A two-year study on used electrical and electronic equipment (UEEE) sent to Nigeria, mostly from European ports, has exposed the continuing problem of non-compliance with international and national rules. Out of the 60,000 tonnes of UEEE sent to Nigeria in 2015 and 2016, at least 15,400 tonnes did not work, according to the study. Under both the Basel Convention and the EU’s Waste Shipment Directive, exporting to and importing non-functional UEEE into Nigeria is illegal. Only functional UEEE that is for reuse may be shipped. To add to the problem, a large chunk of these used equipment reach Nigerian shores without being declared as UEEE. Instead, they come mixed with other goods such as bicycles, kitchenware, sports equipment and furniture. During the course of the study, 3,622 import documents for UEEE in containers were inspected, along with 2,184 used “roll-on/roll-off” (Ro-Ro) vehicles (they are driven onto and off the ships rather than transported in containers) and 201 shipping containers. In a disturbing exposure, the study found that almost 70 per cent (41,500 tonnes) of the UEEE reach Lagos inside vehicles destined for Nigeria’s second-hand auto market. However, UEEE imported in second-hand vehicles was mostly undeclared. More than 60 per cent of UEEE imported in containers was declared as household goods in official paperwork. In absence of infrastructure support in Nigerian ports, only basic functionality testing was conducted in two ports in Lagos under ‘Person in the Port (PiP)’ project implemented by the Basel Convention Coordination Centre for the Africa Region (BCCC-Africa) and the United Nations University (UNU), as part of ‘Solving the E-waste Problem (Step)’ Initiative. “In the best case scenario, our study shows, at least 15,600 metric tonnes of non-functional UEEE is imported into Nigeria each year. UEEE containing hazardous substances like mercury and (H)CFCs—are among the products with the highest non-functionality rates and the highest import volumes,” says professor Percy Onianwa, director, BCCC-Africa. Actual volume of nonfunctional UEEE imports are probably higher than estimated, according to this report co-authored by BCCC-Africa and the Sustainable Cycles (SCYCLE) Programme of United Nations University Vice-Rectorate in Europe. LCD-TVs and flat panel monitors made up the largest category (18 per cent) of imported UEEE. Fifty-five per cent of these were found to be non-functioning, hence, adding to e-waste burden. The report also reveals that 50 per cent of mobile phones imported to Nigerian shores are non-functional, and thus, considered e-wastes. 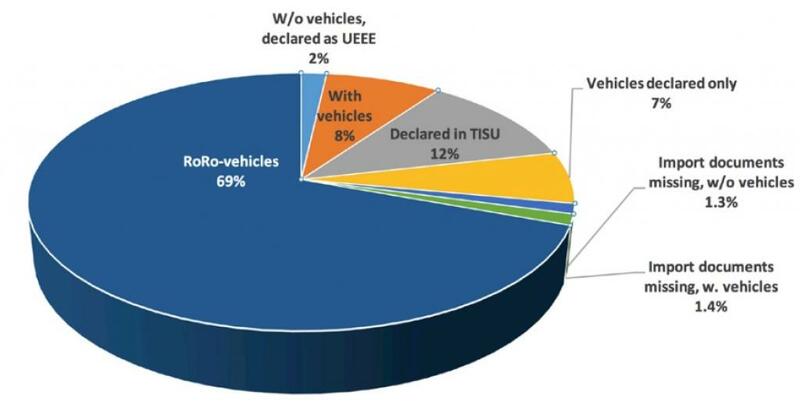 Interestingly, out of the total UEEE imported inside second-hand “roll-on/roll-off” (Ro-Ro) vehicles (driven onto and off the ships rather than being transported in containers) about 98 per cent came from EU member states and the rest from the US. Around 77 per cent of the assessed UEEE imports were from the EU, mainly Germany and the UK. “The importation of UEEE in vehicles is economical for the shippers because it fills valuable space during shipments,” says Onianwa. As the contents in RoRo-vehicles are not yet on the radar, they avoid inspections and functionality tests on UEEE by the regulatory agency, resulting in many tonnes of e-waste arriving illegally into Nigeria. “Imports of e-waste return only marginal profits based on material value alone, making it more attractive to import functional or repairable UEEE. Where UEEE is broken, repair and spare parts harvesting offer higher value returns before recycling for material value,” the professor concludes. “The enforcement of regulations in the countries of export, mainly in the EU and in Nigeria, needs to be strengthened, and closer cooperation amongst local regulatory and enforcement agencies is highly advisable,” says the report. How can Africa breathe easy when millions of used cars from the West hit its roads each year?